I was hoping that my business trip to Bolzano Northern Italy, and side trip to Venice, would include a lot of ravioli eating, but it seems ravioli are not a prominent part of Northern Italian restaurant menus. In seven days I only found two restaurants that actually had ravioli on the menu. The first place I spotted ravioli was at Restaurant Ribot in Venice, a spot that came highly recommended to me by the hotel concierge. Overall I found the food at Ribot to be too strongly salted, but they had an incredibly rich and creamy panacotta. Their ravioli were filled with sea bream, a white flaky fish, and were sauced with celery foam. The fish stuffing was good, but the ravioli dough was too thick and chewy and the celery foam was really over salted. 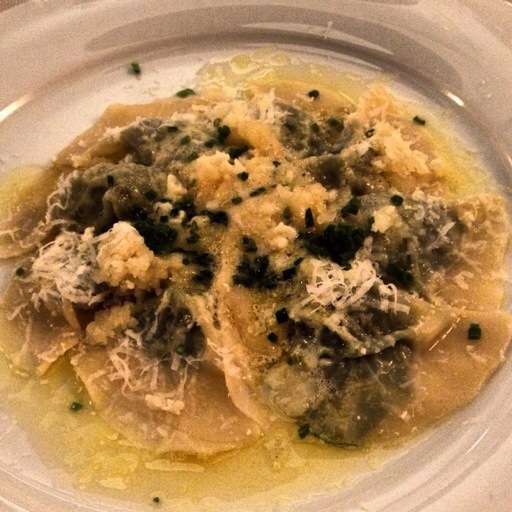 The second place I found ravioli was at Restaurant Zur Kaiserkron in Bolzano. They serve a delicious home made spinach and cheese curd filled spelt ravioli which are plated on top of melted butter and, what they list on the menu as, grey cheese. I’m not sure what grey cheese is exactly, but it was similar in taste and consistency to mozzarella. 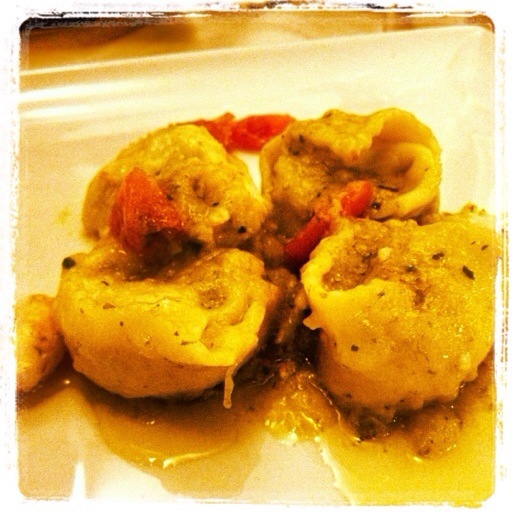 I’m afraid my photo of these ravioli is pretty weak, but if you are ever in Bolzano try this dish.